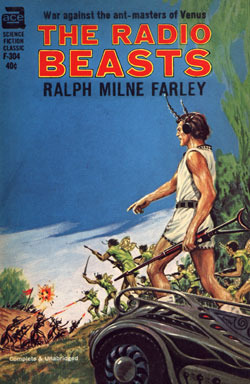 Once you get past Wikipedia, there is precious little on Ralph Milne Farley on the Internet, at least that I could find. I won't go over the same ground as Wikipedia (with one exception). According to the Internet Speculative Fiction Database and the online Encyclopedia of Science Fiction, Farley's first genre fiction was "The Radio Man," a serial that began in Argosy All-Story Weekly with the June 28, 1924, number. 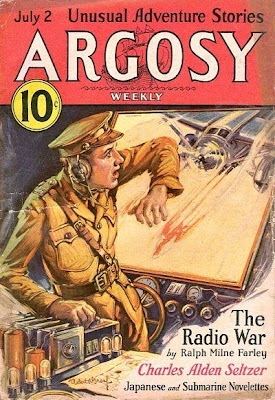 A planetary romance in imitation of Edgar Rice Burroughs, "The Radio Man" was followed by "The Radio Beasts" (1925), "The Radio Planet" (1926), "The Radio Flyers" (1929), and many more sequels. 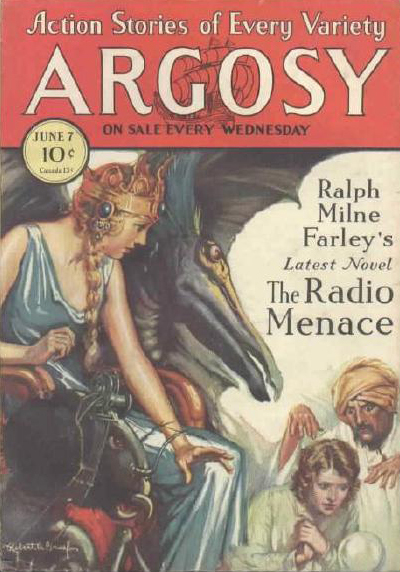 The "Radio Planet," by the way, is Venus, and the "Radio Man" is Farley's hero, Myles Standish Cabot. Like his creator (and his creator's pseudonymous persona), Cabot has three names and is named after a prominent New Englander. H.P. Lovecraft would have been happy. In one way or another, Roger Sherman Hoar went from elite Massachusetts to beer-making Milwaukee as a corporate attorney for Bucyrus-Erie, a manufacturer of earthmoving equipment. 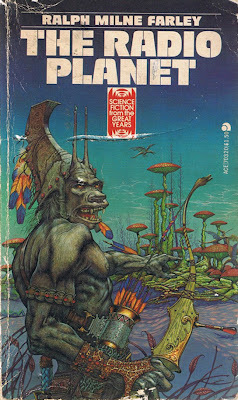 (2) Not all was lost, however, because "Hoar joined the Milwaukee Fictioneers, whose members included Stanley G. Weinbaum, Robert Bloch, and Raymond A. Palmer." (3) When Ziff-Davis purchased Amazing Stories in 1938, Hoar was offered the position of editor. Instead, he recommended Ray Palmer for the position, thus assuring that people would one day know about Deros and flying saucers. 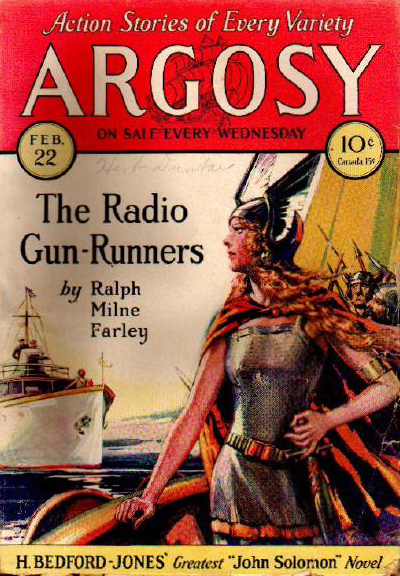 Hoar was a prolific author and had an unusual career writing for magazines as varied as Argosy All-Story Weekly and True Gang Life. 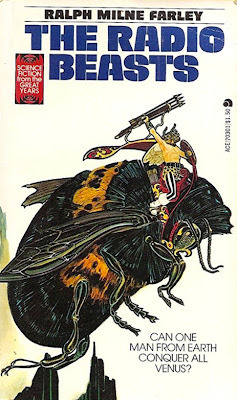 He wrote eleven stories for Weird Tales between 1930 and 1943. I haven't read any of these stories except for "The House of Ecstasy," which is, strangely enough, told in the second person. There are a couple of interesting titles in the list below. "Abductor Minimi Digit" must refer to a muscle, but I can't help thinking of Dr. Evil when I read that title. 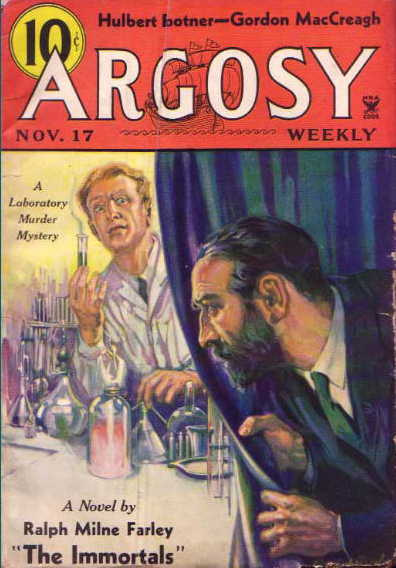 "Test Tube Twin" seems to be a prescient title--a real test tube baby would have to wait for almost forty years before being born. Finally, there is "I Killed Hitler," an intriguing title that sounds like a confessional or like a story from a men's magazines from the 1960s. Roger Sherman Hoar, also known as Ralph Milne Farley, lived a life so diversified in its material aspects that when he wrote, it was truly for the fun and the love of it, so much a recreation that he never wailed about editorial blindness, stupidity, bias, or commercialism. A true amateur, he didn't give a damn what editors were, or what they did. (1) From Book of the Dead, p. 147. (2) Bucyrus-Erie was formed by a merger in 1927. Presumably Hoar went to work there on or after that date. Almost every year between 1924 and 1934, readers of Argosy could expect an installment of the saga of Myles Cabot and his adventures in radio. Many of those stories made the cover. Most were reprinted in later years, some by Ace Books in at least two different editions. 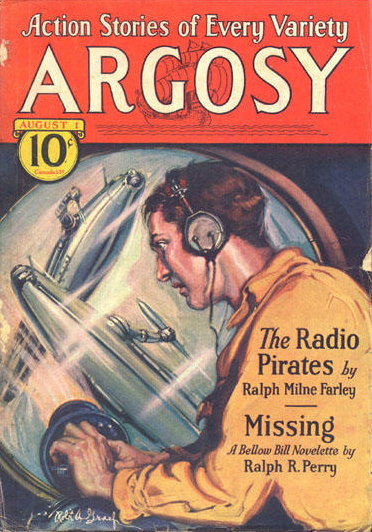 Why the variations on the radio theme? 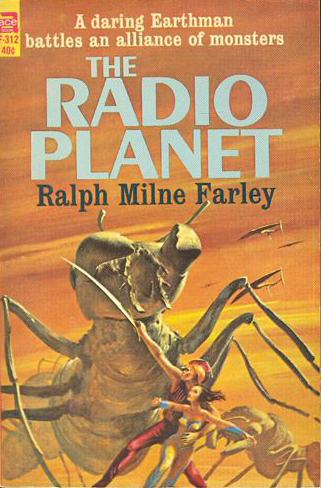 I can only assume that Roger Sherman Hoar--Ralph Milne Farley--was caught up in the excitement over commercial radio, which had begun only a few years before his first Radio Planet story was published. 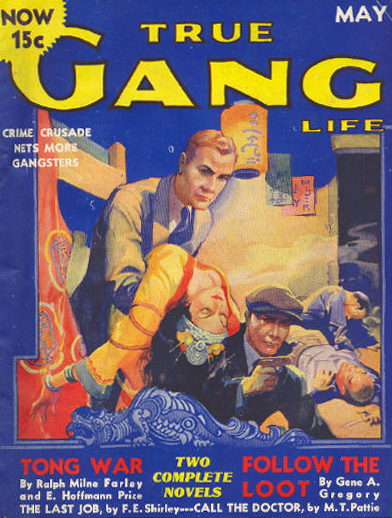 In 1935, Hoar and E. Hoffman Price collaborated on "Tong War" for the magazine True Gang Life (May 1935). Otis Adelbert Kline suggested the collaboration. 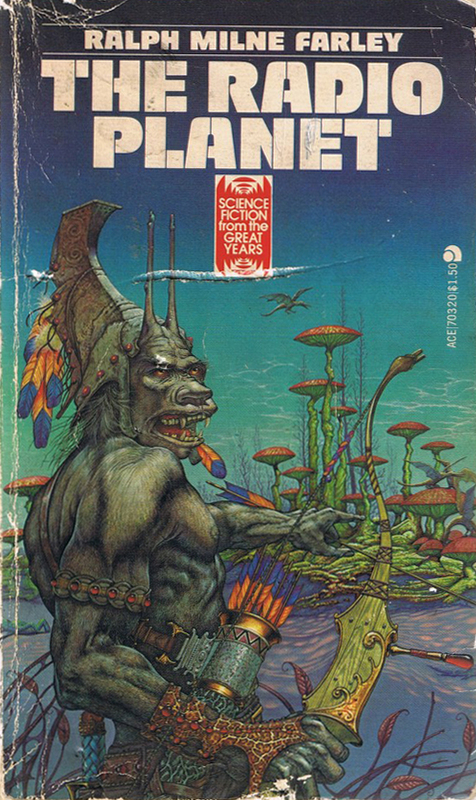 Price--an Orientalist--would provide the background for a tale set in Chinatown. The protagonist, Jim Grant, was Hoar's character. The men corresponded at first, then met in San Francisco in 1935. Their meeting made a deep impression on E. Hoffman Price. Decades later, he wrote about it in his memoirs, Book of the Dead. Thanks for the clarification. One of the things that I have noticed about these authors who are supposedly well known is that little has been written about them. It seems like people dismiss certain authors out of hand. It's good to know that someone out there is watching out for them.